Hey there! Remember me? Has it been five days? How can that be? Five whole days since I’ve blogged?? I’m so, so sorry. 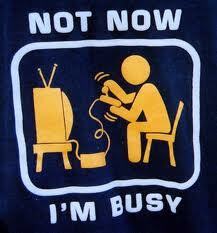 But here’s the facts kids: I’ve been pretty dang busy. So busy, in fact, that I haven’t watched any reality shows lately, nor have I been reading any celebrity gossip magazines (I didn’t even get my US Weekly this past week), and I haven’t been running lately (next week, for sure.). And I hadn’t stumbled across stories about weird crimes. Or so I thought. Holy frothing mouths! How does this happen? Where the heck is Lake Anna? It must be way out in the country, right? Like, someplace heavily wooded (I mean, beavers eat wood, right?) where the main source of income is the selling of homemade beef jerky by the side of the road. But NO! Lake Anna is only about 85 miles away from my home in Alexandria. By Texas standards, this is watermelon seed spitting distance. The girls both reported that they were swimming when they felt something sharp. That just gave me goosebumps. We’re not talking little scratches or warning nibbles either. Although their mother said they are doing much better, Alyssa received around 15 stitches on her upper thigh, while Annabella’s beaver bite cut through muscle, requiring bandages on three wounds just above her knee. Doctors said that closing Annabella’s wounds would increase the risk of infection and both girls are receiving shots for rabies. So, this lucky kid gets to hobble around for the rest of the summer with open wounds caused by a rodent. That sounds just awesome. Don’t worry. The Radnovich clan took care of this beaver pretty damn efficiently. 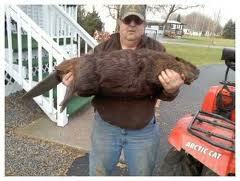 The girls’ uncle shot the beaver with a BB gun and then killed it with a knife. He turned it over to health department officials who confirmed the animal did indeed have rabies. Apparently, aquatic attacks of the furry kind are on the rise. A triathlete in Minnesota (who, by the way, was wearing a wet suit) recently wrestled with an otter in a lake in Duluth. Quick sidenote: otters are related to beavers, right? Wikipedia says beavers are rodents (second largest in the world!) but otters are mammals. But they look the same to me. 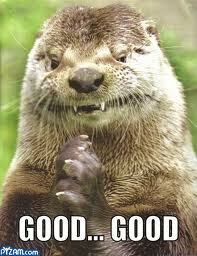 If anything, otters look slightly friendlier, but apparently not. Fangs pierced Leah Prudhomme’s legs as she swam through the deep, dark rum-colored waters of Island Lake. OK, now we’re talking! That’s quite an intro there. Paint me a picture, young Kelly Smith. The suspense and terror continue to build throughout the article. In between peppering her with puncture marks, the animal’s head popped up a few feet away. That’s when Prudhomme noticed its distinctive long tapered tail, small beady eyes and gray head. An otter. This story did not have as satisfactorily an ending as the Virginia one though. It appears the blood-lusting otter got away. This, my friends, is an example of how one falls into a weird news wormhole. One minute you think you have nothing new to write about. The next, you find a trend of completely unprovoked animal-on-human attacks. All I know is I won’t be going near any lakes this weekend. I might even skip the bathtub. Petunia’s been staring at me in ways I’m not comfortable with.